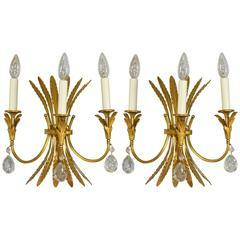 Stunning pair French style gold doré bronze three socket sconces. Twisted arms with grape clusters details. Fruit designs at the top featuring pineapple, grapes and apples. Three-dimensional rose reliefs at the bottom. Two pair are available. Price reflects one pair. Impressive French style ten-arm chandelier in bronze with a gold doré finish. Ornate swag and rose details on the chain. Shades are not included. Three pairs of French Louis XVI style 20th century bronze doré three-arm Horn wall sconces with bow knot top and tassel bottom (Priced per pair). Large, imposing 19th century Louis XVI dore bronze wall sconces that have been electrified. Very heavy, very awesome. 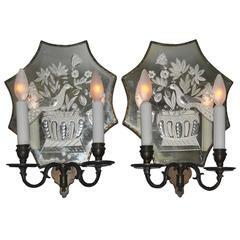 Pair of French Directoire style bronze doré double wreath two-arm wall sconces with two bird heads and arrow design (19th Century). Pair of French Louis XV style bronze doré wall sconce with five arms and cupid holding musical instruments with floral trim (19th century). 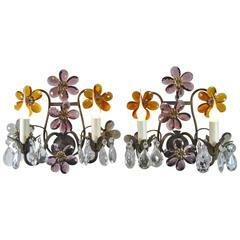 This handmade pair of Maison Jansen style tole sconces feature hand-painted flowers and foliage. A wonderful pair of French doré bronze female/maiden sconces with floral garlands and swags in the regency decor attributed to Francois Linke.